← Wednesday 8th April 2015 – This scarecrow will give you nightmares!! Thursday 9th April 2015 – Inspection Day!! Today was our plot inspection by the Council. This always happens about this time of year. When our allotment agreement was redrafted (why they felt they need to do this, we’ll all never know) several years ago, they said that our plots needed to be 75% cultivated at all times. Now you know as well as I do that this isn’t possible for most of the year. The agreement was cobbled together by the Council, all of whom knew nothing about allotment gardening. We were all up in arms about this, and they rapidly changed it with our input. They saw sense and now everything is fine and dandy. Now when they inspect our plots in the Spring they just want to see that we’ve started. I should be ok. Yes I’ve been working on one of my plots planting Garlic, Onions and Carrots. But I’ve done nothing yet with my other plot. Still it’s only got a few light weeds on it, and next week I’ll be turing it over to put in my Potatoes. It’s been worse and I’ve not got a letter, so I doubt if I’ll get one this year. To be honest, it’s nothing to panic about, they’re just making sure you still want your plots. Now onto the gardening stuff. I planted more Onions and Carrots today, not as much as in previous days, but the weather has been so sunny all week that I had to water what I’ve already put in. I’m hoping that the weather we’re having now, is a good sign as to a brilliant Summer, but only time will tell. Today I sowed “Paris Market 5 (Atlas)” Carrots. These are great if you need to grow them in a shallow container as they’re small and round, great for kids to grow as Lottie and Dottie will tell you. Hopefully I’ll be able to finish the rest of the Carrots and Onions off tomorrow. I’ve started to dig over the next section for them, so hopefully I’ve grown enough to last us a fair while. 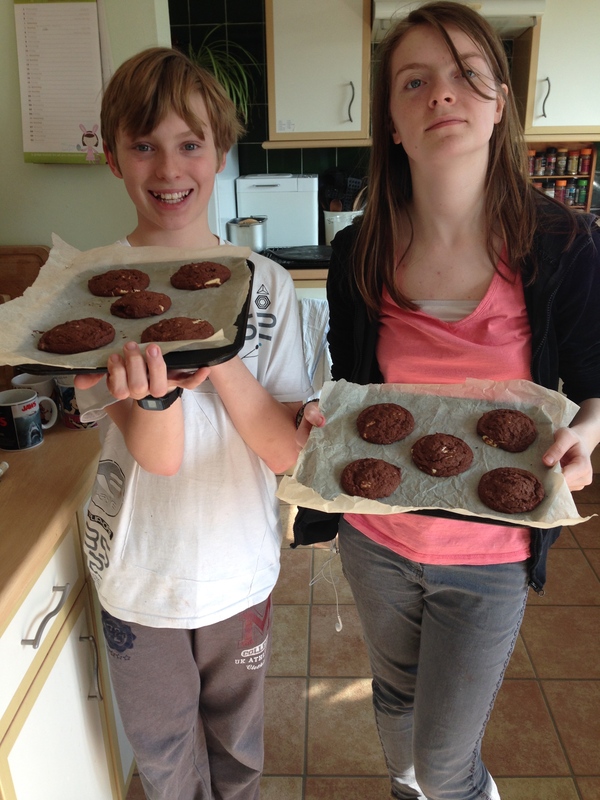 Then after lunch this afternoon I showed Emily and George how to make my Triple Chocolate Cookies. The first batch are out and the second batch are in. They did very well, but trying to stop them eating the raw cookie dough was rather tricky. This entry was posted in Uncategorized and tagged carrots, claire's allotment, garlic, Lottie and Dottie sow carrots, onions, Paris Market 5, potatoes, Triple Chocolate Cookies. Bookmark the permalink. 3 Responses to Thursday 9th April 2015 – Inspection Day!! when do you move Claire ? Still not got a date, but we’re very close. Hopefully we can fix a date next week. But realistically we’re looking at hopefully moving by the end of May! !